As most cultures across the globe, tradition is strong, holds value, and represents who you are and where you come from. 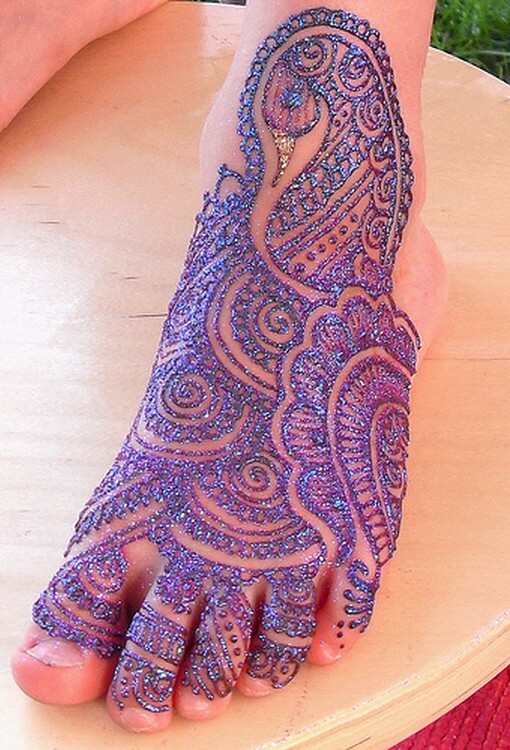 Henna is used for the art of temporary tattooing, also known as mehndi. 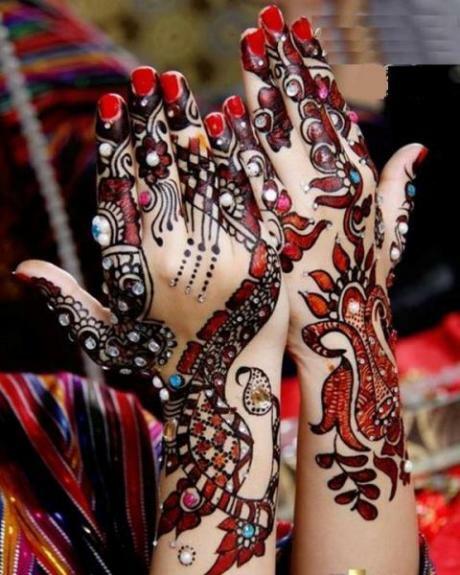 Henna is commercially cultivated in UAE, Morocco, Algeria, Yemen, Libya, Saudi Arabia, Pakistan, and Sudan. For skin dyeing, a paste of ground henna (either prepared from a dried powder or from fresh ground leaves) is placed in contact with the skin from a few hours to overnight. Henna stains can last a few days to a month depending on the quality of the paste, individual skin type, and how long the paste is allowed to stay on the skin. Since it is difficult to form intricate patterns from coarse crushed leaves, henna is commonly traded as a powder made by drying, milling and shifting the leaves. The dry powder is mixed with lemon juice, strong tea, or other mildly acidic liquids to make a preparation with toothpaste-like consistency, which can be used to make finely detailed body art. The henna mix must rest for 6 to 24 hours before use, to release the lawsone from the leaf matter. Essential oils with high levels of monoterpene alcohols such as tea tree, eucalyptus will improve skin stain characteristics. The paste can be applied with many traditional and innovative tools, including resist, a cone, syringe, Jac bottle or fingers. 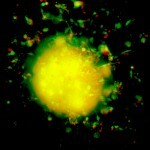 A light stain may be achieved within minutes, the longer the paste is left on the skin, the stronger the stain will be, and should be left for several hours. For over five thousand years henna has been a symbol of good luck, health and sensuality in the Arab world. The plant has been associated with positive magic and provides us with a link to an ancient age full of good and bad spirits, baraka and jnoun. Generations of women have used a paste made primarily of dried ground henna leaves to cover their hands and feet with designs ranging from simple blobs to intricate geometric patterns designed to ward off evil, promote fertility and attract good energy.While there is some controversy over the origins of the use of henna as a dying agent, the earliest clear evidence of henna application on the body appears in Egyptian mummies whose hair and nails were stained with the reddish brown tones of henna. Botanists believe the henna plant, Lawsonia inermis, originated in Persia. It grew extensively in Egypt and was carried to India where it was used since at least 700 AD for decorating hands and feet. 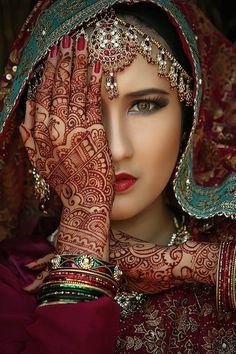 Historically henna has also been used for medicinal purposes, to dye cloth and leather as well as hair, to color the manes of horses and other fur of other animals.Brides throughout the Arab world still participate in the traditional henna party or ceremony. Henna is not only decorative but also carries good luck and fertility; it has baraka and protects against jnoun. In some areas women attend a party shortly before the wedding during which the bride’s hand’s and feet are painted with intricate designs. The henna paste is carefully applied and must remain undisturbed on the skin for several hours to create a strong dark stain. During this time the bride is waited on by her friends and family and has a final opportunity to socialize without the responsibilities of a husband and, ultimately, a family. 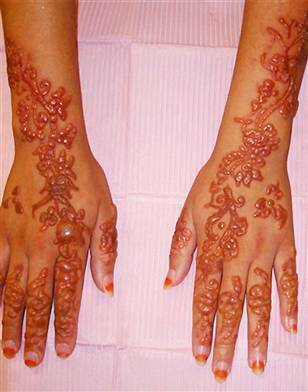 In other areas henna application can be part of the actual wedding ceremony or is applied immediately before the ceremony.The henna plant has significant baraka attached to it. Legend has it that Mohammed used henna to dye his beard and that the henna flower was the Prophet’s favorite. 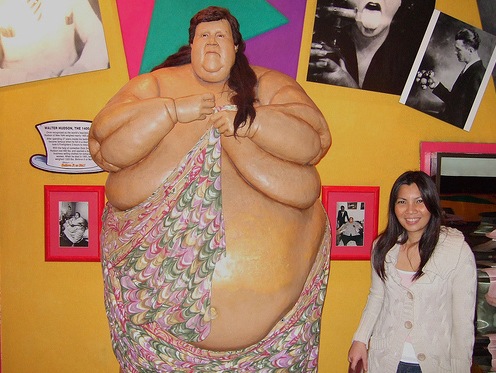 As a result, henna occupies a unique place in the Moslem world. It is used for both decorative and magical purposes and has religious sanction.While the present generation of Arab women may apply henna for fun, some still turn to it for its magical properties. Henna is used to protect against witchcraft or the “evil eye” and many of the motifs used in henna design are designed to ward off the eye’s power. The unique geometry of Moroccan Berber design (pictured) is a result of ancient animistic beliefs and Islam’s prohibition of artistic depictions of animals or humans. While the Berbers converted to Islam, many still secretly clung to their traditional beliefs. They developed simple geometric representations of animals, which they used without overtly violating Islamic codes. We see these geometric motifs in rugs, ceramics, and jewelry and in henna design. Each artist has her own recipe and preferred technique of henna application. Until recently most artists applied henna using small sticks and only the most experienced artist could successfully execute a detailed design. Today some artists still use sticks or toothpicks, though many prefer homemade plastic cones or large syringes. 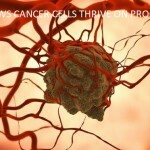 Both tools make application easier and faster. In the U.S., artists can also use plastic applicator squeeze bottles (Jacquard bottles) fitted with small metal tips. These were originally designed for fabric paint and are available in art supply stores. Many artists carefully guard their henna recipes, only passing them on to a chosen relative or friend. Most recipes contain some combination of sifted ground henna leaves, strong black tea, lemon juice and a few drops of eucalyptus oil. The thickness of the paste determines the ease of application. Too watery paste means the design will run, and overly thick paste is difficult apply. 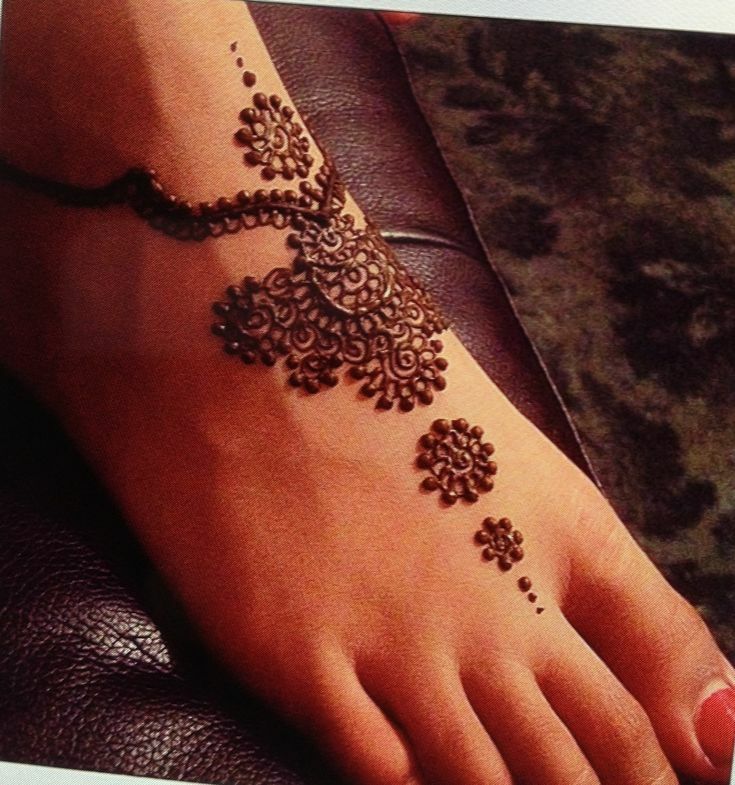 Factors which influence the intensity of the final design include heat, warmth which darkens the stain, and length of time the henna paste is left on the skin. Once the paste is applied it will dry and eventually crack. Some artists suggest leaving the paste on for an hour or two; others insist on leaving it on overnight before scraping it off to reveal a stain which darkens on its own over the next day or so. Whatever the artist’s system, one can be sure it is the product of a tradition kept alive by generations of women throughout the Arab world as well as the Indian subcontinent. In the past few years, a new crop of artists has emerged in the U.S. bringing contemporary designs and techniques to the craft. 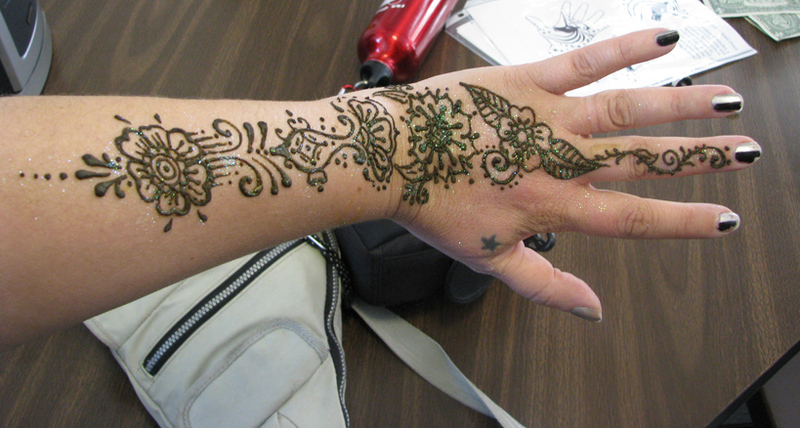 But no matter how it evolves, one can never separate henna from its ancient traditions and the magic it continues to generate.Marilyn Cvitanic Ph.D. teaches studio art and art history at Mt. St. Vincent’s College in Riverdale, New York.